We continually get asked if we make custom shadow boxes and other projects. The answer is “yes we do”. Not just shadow boxes, but other projects as well. 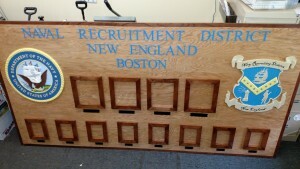 Just recently we finished a Command Board for Naval Recruiting District New England in Boston. Although Custom projects do take more time they are worth the wait. This Command board is just a little over 8′ by 4′ oak plywood trimmed out with solid cherry ant solid cherry slide in picture frames with plexiglass fronts. The Navy Seal and the NRD New England logo are 3D solid wood images that were hand painted. and the lettering is 1.8″ blue acrylic. NRD New England was ecstatic about the board when they picked it up and are currently considering us to make an Awards board for them as well.